as the journey to find it. Being grounded in reality starts with enlightenment. If you’re seeking answers to life’s most asked questions, it’s time to call upon the divine. When you know how to reach them, spiritual guides can tell you how to thrive. Every person walks this planet with a purpose, some more aware than others. So often we’re told finding our true pathway must be a difficult, demanding journey. But answers are as accessible as you make them. Need to know where your prince-charming is? Let’s bypass the tedious task of kissing frogs. Wondering why-in-the-world your bank account is still a garden of tumbleweeds? We’ll clear a path toward prosperity through manifestation. Sick of feeling like a failure in business? Get out of your head, get out of your own way, and get grounded in accomplishment. All of these questions, and more, can be answered when you start believing in the other side, the magic of this world. Everyday people can break down misconceptions and missed-opportunities so they can wander (or waltz) into the next day without flinching and reach destinations they’d only dreamed possible. Listening to your God-given intuition means second-guessing yourself is no longer second nature. Doesn’t it feel good to know exactly where you’re supposed to go? 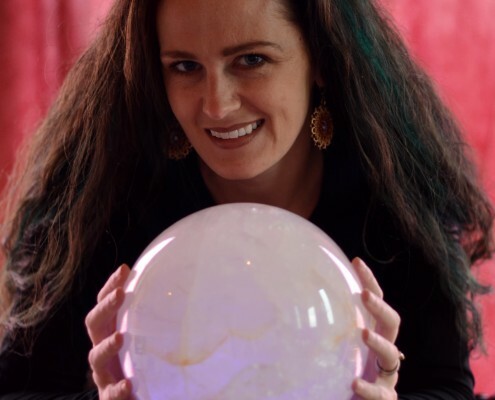 I’m Marin Graves, a gypsy grounded in reality, a psychic reader and rootwork practitioner. I’m a mom and wife with a rap-sheet full of awesome (degrees and certifications). Together, we dig deep beneath the surface of life to unearth the answers you need. Let’s be honest, you found yourself here because you want solutions. You have two options: you can either sit still, believing seeking help makes you weak OR you can try something new, something that’ll change the course of your life forever. The bravest, most open souls are those who stick around from here. You’re my kind of people.